The report found that Chrysler followed the criteria for targeting dealers for termination. The automaker was criticized for not providing an appeals process. Editor's note: An earlier version of this story had an incorrect title for NADA Chairman Ed Tonkin. WASHINGTON -- The National Automobile Dealers Association today supported a government audit critical of the abrupt dealership closings initiated by General Motors and Chrysler last year while saying it would be unlikely to pursue other legal options on behalf of rejected dealers. “I don't think we can do anything at this point; it would be like pushing toothpaste back in the tube,” said Ed Tonkin, the association's chairman, in an interview. Leaders of a group representing terminated dealers, meanwhile, said they are plotting their next steps. “We do not see how these cuts make economic sense -- not for the companies, not for the dealers, not for local communities and certainly not for the struggling U.S. economy,” NADA said in a statement in response to Sunday's report from the Office of the Special Inspector General for the Troubled Asset Relief Program, which provided more than $80 billion in loans to keep the automakers and their finance arms afloat. The association said Inspector General Neil Barofsky's report also validated congressional efforts that gave thousands of dealers the opportunity to have a neutral arbitrator review their cases. The report questioned the criteria used to terminate dealers. It also said cost savings were not the reason for the dealership closings, even though GM and Chrysler told Congress the terminations would speed recovery from their 2009 bankruptcies. Dealer arbitrations ended last week and the decisions are binding. The ad hoc Committee to Restore Dealer Rights helped pass legislation making those appeals possible. Tammy Darvish, another of the committee's leaders and a NADA director, said the federal Auto Task Force and the auto manufacturers should be accountable for their behavior before Congress and in the federal bankruptcy court. Darvish said the committee had been in touch with high-level members of Congress over the weekend, but was not more specific about what kind of action the group might seek. Members of Congress asked for the review of the dealership terminations because of confusion over the criteria used to reject dealers and questions surrounding the automakers' claims of benefits resulting from the closures. Former GM CEO Fritz Henderson, for example, told Congress last year that the dealer shutdowns would save the automaker more than $2 billion. The fact that GM and Chrysler offered to reinstate some dealers following the passage of mandatory arbitration legislation and GM's statement that restoring dealers wouldn't hurt its recovery suggests “the number and speed of terminations was not necessarily critical to the manufacturers' viability,” the report said. The report found that Chrysler, which made decisions on a case-by-case basis, followed the criteria for targeting dealers for termination. But it criticized Chrysler for not providing dealers with an appeals process. GM was taken to task for inconsistently applying its criteria for termination. For example, GM said it would close a dealer with either annual sales of fewer than 50 new vehicles in 2008 or a score less than 70 using its “Dealer Performance Summary” formula. Two of the wind-down dealerships scored above the thresholds on both measures and others exceeded one of them. GM offered to retain 41 percent of the 858 dealerships that had DPS scores below 70 and nine of the 394 dealerships that sold fewer than 50 new vehicles in 2008. In the weeks before the audit was begun, the two automakers had announced they were shutting down about 2,100 dealerships to save costs and become more competitive. President Barack Obama signed a law in December that required the automakers to offer binding arbitration to dealers whose outlets were being closed. GM said in March it planned to reinstate 661 dealers after the company began re-evaluating the closing of 1,100 retailers. Chrysler said that same month it was offering new franchises to 50 dealers who applied for arbitration, in addition to 36 previous offers or new agreements. 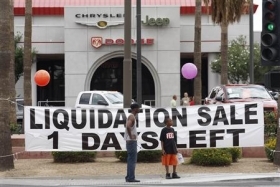 Chrysler terminated 789 dealers in June of 2009 and said in January that 409 had applied for arbitration. Chrysler, in a statement, continued to defend the terminations, calling it “rightsizing” the dealer network. “This optimized dealer network is already contributing to improved vehicle sales for Chrysler and will be a vital part of the Company's success as we continue to deliver outstanding products to our customers,” the statement said. GM said it cooperated with the federal auditors. David Phillips, Philip Nussel and Bloomberg contributed to this report. “Importantly, the Inspector General's report also validates the Congressional efforts which gave thousands of dealers the opportunity to have a neutral arbitrator review their cases and possibly save thousands of jobs.